The Bubblemaker Course is designed to give young people aged 8 and over the opportunity to enjoy SCUBA in a fully supervised and controlled environment. Here at DIVE Rutland, we love having the Bubblemakers around, their excitment is contagious!!! 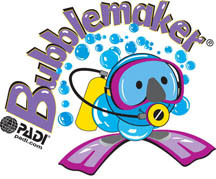 Bubblemakers attend our centre along with their parent/guardian supervisor and are introduced to the world of SCUBA diving, the equipment they will be using, how to be safe and, not least, the underwater fun and games that we'll have in the pool. Put on their equipment, mask, snorkel and fins. Submerge in the pool to a maximum of 2 metres. Swim underwater whilst trying to contain their excitement, smiles and waving! Play games, throw underwater toys and generally have a great time experiencing the freedom that us divers value so much! We conduct Bubblemaker evenings two or three times a month, usually on Saturday evenings and sometimes on Tuesday evenings. In the summer holidays we conduct Bubblemaker (and other diving programmes including Seal Team, Master Seal and Open Water Courses) during the day. Call us to check availablity on 0845 519 5464. All equipment is supplied. Please make sure that a parent or guardian is available to accompany the young diver at all times and that you bring suitable swimming clothing including swimming costumes & t-shirts for girls, beach shorts and t-shirts for boys. Parents/Guardians: Please read our Important Information and perhaps you would like to snorkel or even dive with the children - see what they do and wave back? Many adults would like to photograph or film their children whilst diving. Please talk to us first if you wish to do so. We can also supply underwater cameras for you and the young diver to use during their experience! Here at DIVE Rutland, whilst your kids are in the pool, you can be too! Masks & snorkels will be available on the day for you to get wet and see the action and there's no charge to borrow one of our mask and snorkels! Bubblemaker Courses include around 45 minutes of underwater experience! One final thing!!! Bubblemakers can continue to enjoy the sport of SCUBA through enrolling on our Seal Team programme - this pool based diving programme is great for young divers as an introduction to the underwater realm. Talk to your instructor about signing up! !